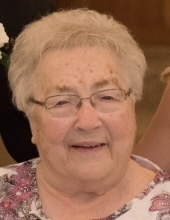 Doris Ellen Chesnut age 81 of rural Dieterich passed away Wednesday, February 20, 2019 at HSHS St. Anthony Memorial Hospital, Effingham, Illinois. Funeral services celebrating Doris’s life will be held at 10:00 a.m., Monday, February 25, 2019 at the Headyville Christian Church with Pastor Carroll Ross officiating. Visitation will be from 6:00 p.m. until 8:00 p.m., Sunday, February 24 at the Crain Funeral Home, Newton and from 9:00 a.m. until time of service Monday in the church. Burial will be in the Headyville Cemetery, rural Dieterich, Illinois. Doris was born on November 16, 1937 in Jasper County, Illinois the daughter of Clarence and Elizabeth (Spelbring) Millsap. On February 10, 1961, Doris married Howard Denny Chesnut. He preceded her in death May 16, 2008. Doris was a wife, mother, and homemaker. She worked for the ASCS office in her early years. She was a faithful member of the Headyville Christian Church and the Son-shiners ladies group. For over forty years, Doris served as an election judge in South Muddy Township. In her free time, she enjoyed reading and photography. She often wrote poems for family and friends to honor their special occasions. Doris loved spending time with her family, especially her five grandchildren. Doris will be loved and remembered by her children Peggy (Dale) Radke of Newton; Brent (Donna) Chesnut of Dieterich, and Brian (Tie) Chesnut of Dieterich; grandchildren Kelly (Derek) Sholders of Oblong, Tanner Radke of Newton, Cullen Chesnut of Richmond Heights, MO, Caleb (Emilee) Chesnut of Memphis, TN, and Crayton Chesnut of Dieterich; siblings Dorothy Weber of Trenton, IL, Ray (Joanne) Millsap of Tolono, IL, Helen Meers of Dundas, and Ethel (Bill) White of Maryville, TN. Her parents, husband, brothers Carl, Earl, Harold, and Fay Millsap and sisters Bernice Ernst, Neva Rogers, and Ruby Gocza preceded her in death. Memorial gifts in honor of Doris may be made to the Headyville/McQueen Cemetery Care Fund. To plant a tree in memory of Doris Ellen Chesnut, please visit our Tribute Store. "Email Address" would like to share the life celebration of Doris Ellen Chesnut. Click on the "link" to go to share a favorite memory or leave a condolence message for the family.